Those who think that climate change is boring, have never seen a glacier disappear. Recently I discovered, to my great astonishment, that many people think that climate change – my research field – is boring. That even some employees of this newspaper start to yawn when they hear the word «climate». And admittedly: I don’t get that enthusiastic either when I hear policy terms such as «sustainability» or «green economy». But when I think of climate change, I think of riding on a snowmobile through the frozen Siberian tundra to set up a measurement station. In the middle of a polar desert, where polar foxes roam freely, snow owls fly across the sky, and where it’s possible at any moment to find yourself in the middle of a snow storm. Or to be on my way in a boat to our research station in Greenland, where in the evenings the sun sets behind the mountains while fog slowly drifts into the fjord. A fjord in which whales swim who, with their tails pointed towards the sky, announce that they are diving back down below. Thawing permafrost, disappearing glaciers: climate change is for me all but boring and abstract. It saddens me therefore when people glaze over when the word «climate» is mentioned. But I can understand such a reaction. Not everyone has been able to see with their own eyes what our fossil fuel emissions are doing to the polar regions, or has sailed through the Amazon and seen the destruction of the rain forest. For most people, climate change is elusive, and far from concrete. This can easily lead to the notion that, while important, climate change is boring. The streets of Longyearbyen flow full of people in recently bought winter coats. They are not allowed to go out into nature. How can we make climate less boring? Send everyone on a climate holiday? Rather not, there are already enough so called «eco-tourists» in the fragile nature of the world, with accompanying CO2 emissions. Gigantic cruise ships with thousands of people on board are sailing through the polar regions. I sometimes see them in Longyearbyen. When such a ship sets ashore, the population of this small town doubles. The streets flow full of people in recently bought winter coats and fancy new SLR cameras around their necks. With those, they make a picture of the stuffed polar bear in the supermarket and the gigantic sweater that’s on the wall of the shopping mall. After a hurried visit to the museum, many of them return to the warm ship with all its entertainment. They’re not allowed to walk freely in the nature outside of town, since that’s prohibited without a rifle. Whether these people understand anything of the remarkable place they are in, is unclear. 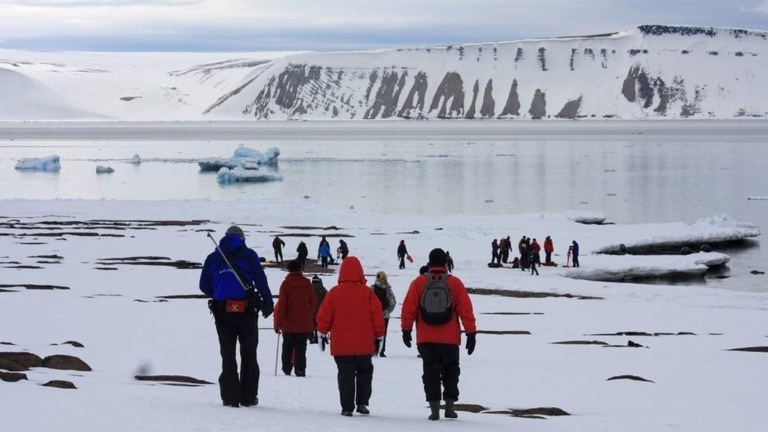 Of course there are tourists who stay in Spitsbergen for longer, and go out into nature under supervision of a guide. But they still wouldn’t see nature in the same way as a researcher who studies the same spot over a long time period. For people who do fieldwork in this kind of environment, it is abundantly clear how fragile it is: walk the same route too many times, and you leave behind a trail that will remain visible for years to come. The imprints of climate change are less clear, and are only apparent through a lot of repeat research at the same spot. Changing vegetation, a glacier that disappears: In a few days, a tourist will not experience this. Besides, would a tourist want that? On holiday you’re supposed to have fun. See new things. Not be bothered with everyday problems. To go with a dog sled through the snow, and enjoy the beautiful landscape. Having a great time, without having to think about something as depressing as climate change. Out in nature: Ecotourism can provide great holiday experiences, but at the same time this has an impact on already fragile nature. Here on Spitsbergen. So no, climate tourism is not the answer. But is there something else that may help against the boringness? More outreach? Well, films such as «An Inconvenient Truth» already popularised climate change for the wider public. And ahead of the climate conference in Paris, it was virtually impossible to open a newspaper where the issue wasn’t discussed. There is no lack of attention to climate, and with too much attention the risk increases that it becomes boring. But I would like to argue that it’s not the attention to, but the consequences of climate change that are really boring. In Oslo, there wasn’t a real winter this year until January. And even then it was only cold for a few weeks before it thawed again and the snow disappeared. Just before that, I could enjoy the snow and went out for some cross-country skiing. The guy who ecstatically shouted «skiing!» when he passed me has probably stowed away his skis again. In the future there will be winters in which the people of Oslo don’t even need to bother to take them out at all. A winter where it’s only a few degrees above zero, dark, and raining: that’s really boring. How vague and boring «sustainability» and «green economy» may sound, remember that they stand for something very concrete: A cleaner environment. Our best chance for snow in winters to come. A last chance not to ruin the world, full of beautiful nature such as I have seen in Siberia and Greenland, and which I hope will not be irreversibly damaged by climate change. A little bit of boringness from time to time is fine by me, if it ensures a much more fun future to live in.